Rules of Golf: Are Carts and GPS Devices Spoiling the Game of Golf? Are Carts and GPS Devices Spoiling the Game of Golf? The following recent correspondence is self-explanatory. Just seen your clip on Andy’s Home of Golf tv site. I have a question, which I believe is fundamental to the way golf is played, but is it covered in the Rules? As walking, is the central part of the game and connects each phase of the game, is there any mention in the Rules about walking. I ask this because with the invasion of the little golfing carts (and worst still those damn cart tracks scarring our courses), I believe they defuse the game to the point of creating a separate branch of the Golf that many are now calling Cart Ball or Golf. I have nothing against carts for those who need them due age or medical reason to allow them to participate in the game of golf, but otherwise I regard them as the work of the Devil – or the lazy way to play. The Walking campaign/debate is starting get some momentum, if not here certainly in the States (http://www.thewalkinggolfer.com/ ). If I can be so bold to ask another question, which this time relates to distance aids, in markers, sprinkler heads, distance aids either via books or electronic device format. Is there any reference to distance aids and if so when roughly would that have been added? In closing, I would like to thank you in anticipation of receiving a reply. One further item which may or may not be of interest to you, I am a direct descendent of Old Tom Morris (my great, great grandfather) with family connections with Charlie Hunter and Willie Rusack. I believe golf is a walking game with no need for any form of distance aids. I have no problem with the knowing the length of each holes or overall length of the course, however my game is based upon the old eye, brain, swing co-ordination that is calculated as I walk to my ball – this also allows me time to select the club by surveying the land ahead, no need for distance information. I call myself a golfer, but many friends in the USA call me a traditional or purist golfer. A title that I do not really enjoy. Sorry to go on and trust that I have not bored you. I am sympathetic to your views of how golf should be played (walking the course and using eye, brain and swing co-ordination to determine which club to use), but having said that, I fully support the R&A / USGA in permitting the use of carts and distance aids. Remember, that there are estimated to be over 60 million persons playing golf and only relatively few of them are blessed to be playing links or parkland golf on verdant courses. I have played many rounds of golf in temperatures over 35°c and have welcomed being able to use a cart, or buggie as I call them. Also, I am beginning to suffer from arthritis and on a recent week's golf in the West of Ireland, where I played 18 holes on four consecutive days in cold, wet and windy conditions. I know that I could not have done so if buggies had not been available. Having said that, they are not permitted in my own Club, Milltown G.C. in Dublin, except for half a dozen players with medical exemptions, and they have to purchase them for themselves. As for the Rules of Golf, there is nothing contained therein to prohibit the use of carts and indeed there are many references to them, including the Definition of Equipment, which states, "Equipment includes a golf cart, whether or not motorised." However, I am sure that you are aware that the Rules of Competition (totally different from the Rules of Golf) may prohibit their usage. This certainly applies to the Pro tours, with certain exceptions (e.g. ferrying players between a putting green and the next teeing ground) and it is my understanding that the Golfing Union of Ireland restricts the use of motorised buggies, in all their competitions, to persons in possession of a medical certificate of disability issued in the current Calendar Year. I am reasonably sure that this is still the situation with competitions run by most National Golfing Bodies and Authorities. With regard to the use of distance aids, there were changes to the Rules of Golf affecting them in the revisions that took effect from 1st January 2008. The Definition of Advice now includes the statement that, "Information on the Rules, distance or matters of public information, such as the position of hazards or the flagstick on the putting green, is not advice." Also, a Note to Rule 14-3, Artificial Devices and Unusual Equipment, now states, "Note: The Committee may make a Local Rule allowing players to use devices that measure or gauge distance only." I am aware that this Local Rule has been adopted by most 'resort' courses, where slow play has become endemic, and that it is increasingly being introduced by member Clubs across the world. I know that my Club, which celebrated its centenary year in 2007, is coming under pressure from some members to allow GPS distance measuring devices, but I am pleased to say that the Golf Committee has recently agreed to put it off, at least for the current season. I think that the above views are indicative of golfers all over the world, there are those ‘traditionalists’ that would like to see buggies banned from courses and others who rarely play the game without them. 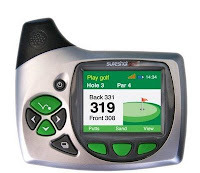 Similarly, there are those that think that GPS distance devices spoil the game and others who want them to be permitted in all competitions, to help reduce the time it takes to play 18 holes under the 4 hours that was once considered the maximum. Whatever your preferences, I hope that you will always respect and abide by the Rules of Golf, the Local Rules and the Rules of Competition. Here's my take on both issues - Carts + GPS devices. 1. Carts:- Yes with medical conditions, no otherwise. I only use one when abroad (e.g. Spain) but mainly because they provide cover from the hot Sun. If I have to stay on the Cart path with a Buggy I never take one as they seriously slow down a round - you have to take a handfull of clubs and walk to and back from your ball which is invariably on the other side of the Fairway. So, no Carts needed on our courses here IMHO. 2. GPS devices. Here I have to disagee with your view for a very practical reason. The rules permit a golfer to find out a distance to the green/pin, (it's not advice etc. ), so most golfers I play with will look around to find a distance marker and then proceed to measure (pace out) how far they are from the marker. Then they'll ask, is it meters or yards, is it to the front or middle etc. This takes too much time and if they had a GPS device they would get a very accurate reading without all this delay. I personally would not use a GPS device. If I can see a distance marker (e.g. 150 yards), I'm happy to calculate roughly how far I am from it without pacing it and select my club. I play off 5 and I'm not good enough to worry about being a few yards out on my calculation. So it amazes me to see high handicappers pacing out precise yardages when their percentage of clean strikes is relatively low (no disprepect intended). So, given that the rules permit knowledge of distances, then we should make it as simple + quick as possible to obtain. Firstly, everyone is entitled to their own opinion and that I respect. I agree with most people about the use of buggies for medical grounds and relief from blazing hot sun when abroad. However, I agree with Jim Halpenny that GPS devices are hear to stay, and will be the norm at most clubs very shortly. I argue that the technology is there, so why not use it if it speeds up play and helps improve golf scores. I cite the technological advances in golf ball dynamics, which enables pros to hit them prodigeous ditances. To me, this is more detrimental to the game of golf than knowing the exact distance from my ball to a bunker or green !